March 11th has rolled around again. Until just a couple of years ago it was just another day towards the end of the school year, and we haven’t yet planted the date so firmly in our calendars that we see it coming from weeks away. It’s easy to be caught unawares when planning other things. Last month I was trying to schedule something at school with a friend and we decided that March 11th would be the best date, started to write it into our diaries and then stopped. March 11th. It’s not an ordinary day. March 11th 2011. At 2:46pm a magnitude 9 earthquake hit off the coast of Tohoku, the northeastern part of Honshu. (The six prefectures are Akita, Aomori, Yamagata, Iwate, Miyagi and Fukushima, the latter three are the ones most badly affected.) In Tokyo, over 300 kilometres away, it felt very big and very long. The tsunami triggered by the quake caused devastation on a scale that even now is difficult to understand. What followed in the hours, days and weeks afterwards shook the Tohuku region and the whole of Japan and gave us a new normal. I remember someone asking me in the days following the earthquake, ‘Is this the biggest thing you’ve ever experienced?’ and for many of us it was. Even now, it’s hard to find the words to explain this feeling. I wrote often and at length over the weeks and months that followed, and archived all of what I wrote when I started this blog. When I look back over those original e-mails I find myself back there, in that mix of anxiety and determination; anxiety about what was going to happen, and determination to stay, to keep faith with the people of Japan and hoping and praying, day after day, that it was all going to be all right. For people outside the Tohoku region it has been. Western Japan was of course affected because the whole country was worried about what was happening, but in terms of everyday life they were not, and a lot of people in Kanto went to Kansai when they felt a need to get further away from Fukushima. In Kanto we were of course closer to Tohoku and specifically Fukushima; we felt the aftershocks and were more directly affected by the unfolding situation. But really, by Golden Week (the block of national holidays at the end of April and beginning of May) life was back to normal. For the people of Tohoku it has not been. According to figures in the newspaper this morning, 700,000 people in Iwate, Miyagi and Fukushima lost their jobs or took leave after the earthquake, and this was 27.8% of the total workforce. The majority of those took leave but in the time since then many have changed jobs and been affected by lower pay. Looking at other figures in the same newspaper, it’s shocking how much has not been done, and even those figures present a picture more positive than the reality, according to local officials. Least progress has been made in what is referred to as ‘town reconstruction’; while all debris has been cleared away from the towns and villages, it has not been disposed of yet. What seems to me to be the most pressing need, for new housing for people who lost their homes, was the worst of all; 20,600 houses are planned, land for only 7,405 has been secured. No mention of how many have actually been built. Two years on, many people are still living in temporary housing. On Sunday I saw a headline which read, ‘¥1.4 trillion to be carried over in quake-hit areas: most unused funds related to reconstruction’. Apparently this is caused mainly by a shortage of manpower and materials, but really, Japan is in a recession, unemployment is high (for Japan) and people need homes and infrastructure. Just get on with it. Make it happen. Communities have been decimated, as people of working age have moved away to find employment and a safer place to raise their children, leaving behind the elderly. I heard about a school in the affected area from one of the students at school, after she returned from doing some volunteer work there. Of 104 students before March 11th 2011, only six remain. When I think about the earthquake and all the horror that followed, my memories are contrasting ones; of the facts and figures, of trying to make sense of all the information, but also of how everyone got through it together. We walked softly, we spoke gently, we all kept a lid on what we were feeling. I remember sitting on buses and trains and feeling the air crackling with emotion, but everyone staying outwardly calm. I remember going cherry blossom viewing in Yoyogi Park and feeling so glad to be outside, in the sunny weather, with thousands of other people. Most of all, I feel proud of just being here, witnessing this great country coping with something unimaginably awful. Yes, there were things done badly; TEPCO officials ran circles round the government and only months later did we hear that there had indeed been a meltdown and a partial meltdown at two of the reactors at Fukushima Dai-ichi. But ordinary Japanese people were amazing, and it was a privilege to be here, the scariest and most inspiring time of my life. This afternoon I attended a memorial service at St. Andrew’s Cathedral. We prayed in silence from just after 2:30 until 2:46. It felt right to be there, in the same place I was last year, with other members of the diocese, silently remembering. It has taken me a long time to write this, the words didn’t come easily. Because really, there are no words. 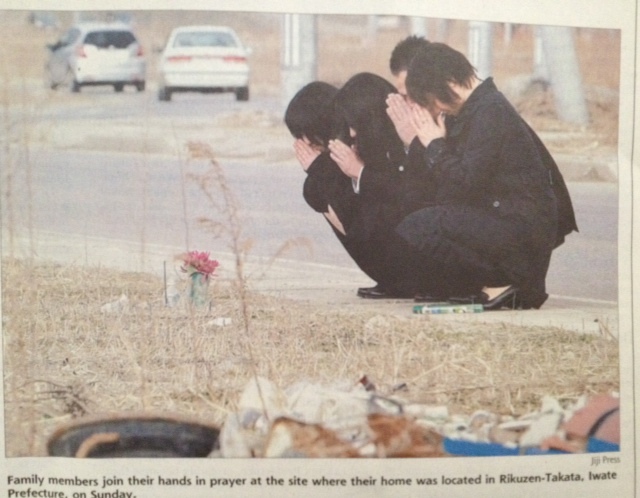 There is a deep sadness that drags you back down into those dark days, a reminder that for the people of Tohoku they still live with the aftermath, today and every day, but with that there is also love, pride and ultimately speechless admiration for the resilience of the human spirit. This entry was posted in Great East Japan Earthquake, Japan, March 11th 2011, Tokyo and tagged Fukushima, Great East Japan Earthquake, magnitude 9 earthquake, March 11th 2011, March 11th 2013, Tohoku, tsunami on March 11, 2013 by tokyopurplegirl. Today’s Daily Yomiuri (English language) newspaper has an article about what you should carry with you every time you go out. This may seem like a case of earthquake paranoia but the fact is that after the earthquake on March 11th 2011, or the Great East Japan Earthquake, millions of people were stranded in the Tokyo area because all the train lines stopped. Some started running again around 11pm (the quake was at 2:46pm), and some started running later but that night there were huge numbers of people stranded at work, forced to sleep somewhere (for example institutions with large halls etc. opened to anyone who needed somewhere to shelter) or who walked home 20 or 30 kilometres in the dark. While I have heard anecdotal stories about other people’s experiences, I was lucky to be at home when the quake happened. Three Japanese friends who were here at the time stayed the night because they couldn’t get home (and I was glad of the company, it was not a time to be alone), and over one hundred students and over twenty members of staff had to stay at school. As you may have considered, when the trains did start running again, there were many thousands of people anxious to get home, and this resulted in terrible crushes, far greater than the usual rush hour unpleasantness. I heard from a friend that another friend of hers was stranded in Shibuya, and waited there until the trains started running again. She was so crushed on the train that by the time she reached her destination she had cracked ribs, and was so traumatised by the experience of being first stranded then crushed, that for months afterwards she carried a fairly hefty rucksack with her whenever she went out with plenty of supplies in case it happened again. * Ready-to-eat foods (e.g. chocolate or candy) but maybe nuts or power bars are better? * Emergency contact information (e.g. phone numbers for other family members) and a copy of your ID. This kind of makes sense, since right after the earthquake the mobile phone networks got overloaded and couldn’t be relied on. Since this also happens regularly around midnight on New Year’s Eve every year it’s reasonable to expect it to happen after any large earthquake. However, on March 11th the landlines weren’t working either and I had to use Skype to contact my parents in the UK even over an hour later, and since almost everyone has a mobile phone now it’s not so easy to find a pay phone. So, ¥10 coins? Probably worth carrying, but it might take you a while to get through to anyone no matter which method you use. It would be better to make sure you carry the means of recharging your mobile phone, and if you have a smartphone to add apps like Skype or Viber. The flu mask is an interesting one. After the earthquake last year the BBC chose as its graphic for any items about the aftermath a photo of 2 Japanese women wearing such masks and cowering amid rubble. To anyone familiar with Japan those masks are a familiar sight; to protect the wearer from germs or pollen, or to protect everyone else from the wearer’s own germs. My irritation with the BBC graphic was the lack of cultural context and the implication therefore that these masks were to protect against possible radiation from Fukushima Dai-ichi, which would be a ridiculous idea. I have found that wearing one will indeed also keep you warm (one of the suggestions for carrying them) but will also result in you re-inhaling carbon dioxide and less oxygen and I very quickly end up with a headache which disappears the moment I take off the mask. Well, there were some stories about these items at the time, but really . . . really? These are useful in the winter and are probably a good idea but they only last a few hours and to carry enough to make a difference would be quite a weight. Better to carry one of those extremely thin Uniqlo heat tech thermal tops, it would take up less space, be much lighter and keep more of you warmer, longer. I think the idea must be to use the large handkerchief as a combination towel and / or furoshiki, i.e. traditional Japanese wrapping cloth. Not a bad idea. * Safety pins (‘to make a towel into underwear’) . . . pardon? There is no towel on this list, so where are you getting that from? Better to carry a change of underwear, surely? Then you can continue to wear normal clothes while this jerry-rigged adult nappy get-up would seem to impede most people’s normal attire. Hmmm . . . some of this makes perfect sense, some is very Japanese, there are some things that seem unnecessary and some things they have not included that I would, e.g. * Toothbrush and toothpaste (again, one of those kits you would pack into the little bag you take on a plane, in fact a little bag like that with mini toiletries is probably a good idea). It all comes down to, how much do you want to carry? Too much and you are going to have a constant reminder with you of impending doom and that will probably do nothing for your general mood. Some of the items suggested are what I think a lot of people carry anyway, and then it’s up to you what you add over and above that. It’s made me think, and without adding too much bulk or weight to my handbag I could make myself more secure with just a few items. This entry was posted in Great East Japan Earthquake and tagged March 11th 2011 on October 11, 2012 by tokyopurplegirl. On Being Very New To Blogging . . .
After the March 11th earthquake last year I wrote a series of e-mails to friends and family. I had several reasons; I wanted to let everyone know how everyone was doing in Japan (as far as I knew) and I was frustrated with the media overseas for their distortions and weaselly misrepresentations of the situation, but most of all I was trying to process what was going on around me and generally keep a lid on what was, at times, the most stressful thing I’d been through. I have archived them all below. They span a year, and I don’t know if there will be more, but for now this is the complete set! I offer them as I originally sent them. This entry was posted in Great East Japan Earthquake and tagged Great East Japan Earthquake, March 11th 2011, Tokyo on September 26, 2012 by tokyopurplegirl.